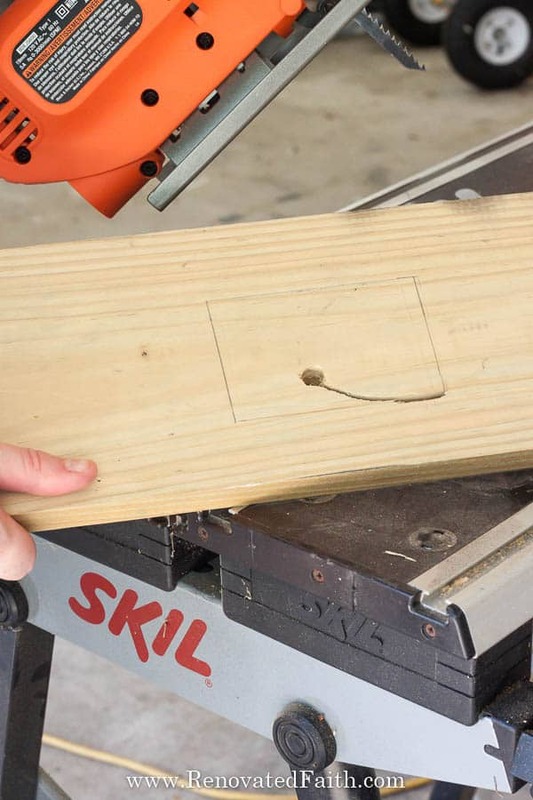 If your next DIY project involves a jigsaw, this beginner’s tutorial offers a video and step-by-step tips for anyone just learning to use woodworking power tools. I show you how to cut curves as well as how to cut a straight line using various thicknesses of woods in a few simple steps. 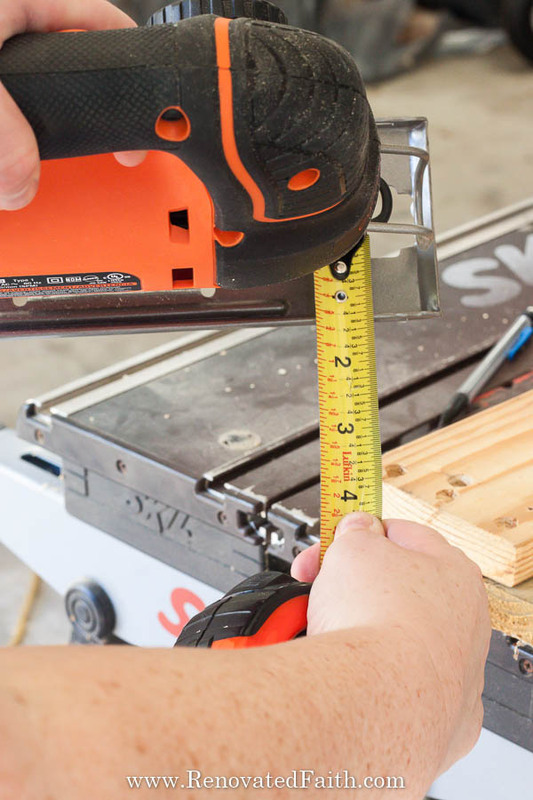 Don’t let power tools intimidate you. Learn some safe short-cuts and simple tips in my tutorial How to Use a Jigsaw, Step-by-Step Beginner’s Guide. ✅ If you are in a hurry, here is the type of jigsaw I use that makes learning to use this tool so easy! Check the current price here. The jigsaw is a great beginning woodworking tool great for cutting curved lines in wood but also easy enough to use for straight lines. 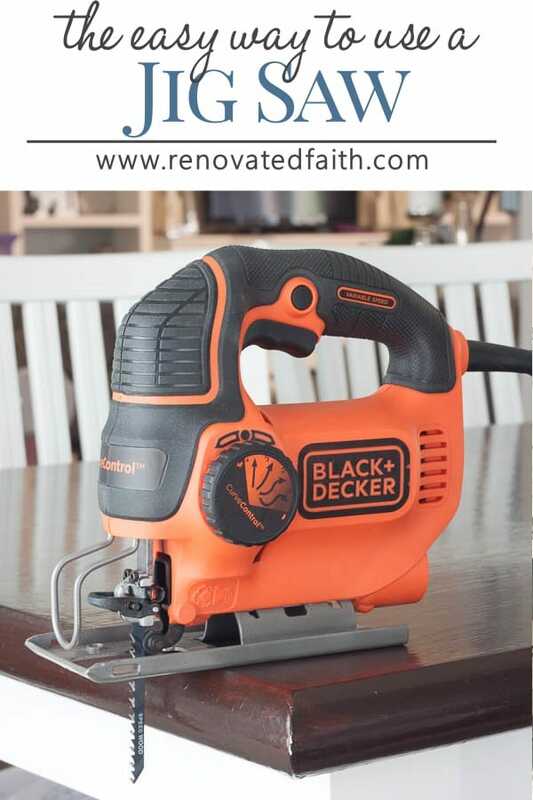 You can cut wood, metal and even plastic with this fabulous power tool. Are you a victim of PTI? Power Tool Intimidation? Every single time that I prepare to use a new power tool, I think it is going to be so difficult. But fortunately the opposite always happens. The tool that I was sure would be a struggle to use ends up being a fantastic addition to my DIY arsenal. With these simple tips you’ll be using with confidence in no time. (You can also check out my post on How to Sand Furniture and Renovated Faith’s YouTube channel). 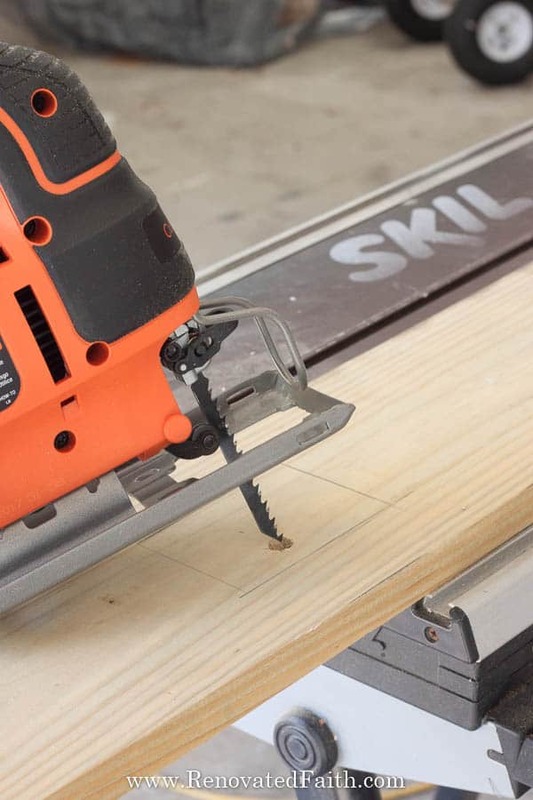 Jig saws are perfect cutting shapes into wood or cutting straight lines when you don’t want to bother with getting out a more heavy-duty saw for quick cuts. I use mine for almost everything where cutting is involved. Also, jigsaws are relatively inexpensive in comparison to other woodworking tools like circular saws, miter saws and especially table saws. You can find them from $24 on up to $160 for a more professional model. Click here for the best jigsaw tool prices. 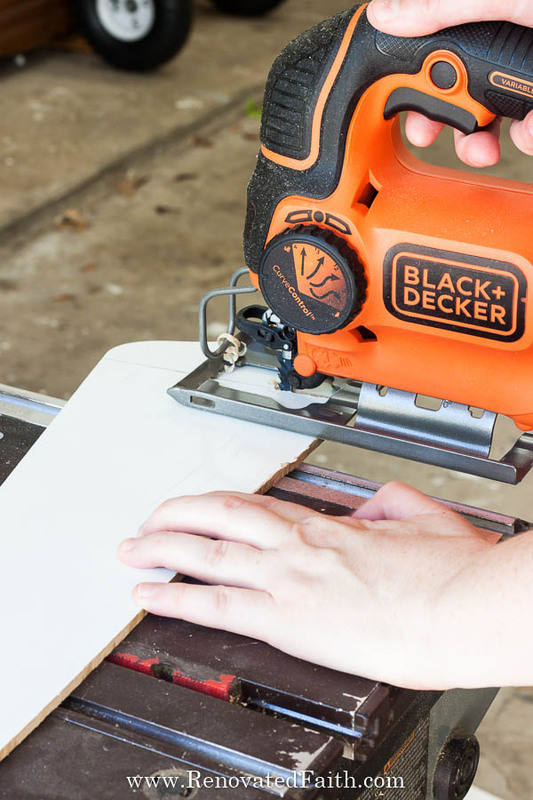 Black and Decker Jig Saw – This is an easy to use jigsaw. Check the current price here. Blades – I’ve had good luck with this set. Check the current price here. Mask – These masks are great because they are easier to breath through and, therefore, not as hot. Safety Glasses – Here is what I use but you can get the anywhere. 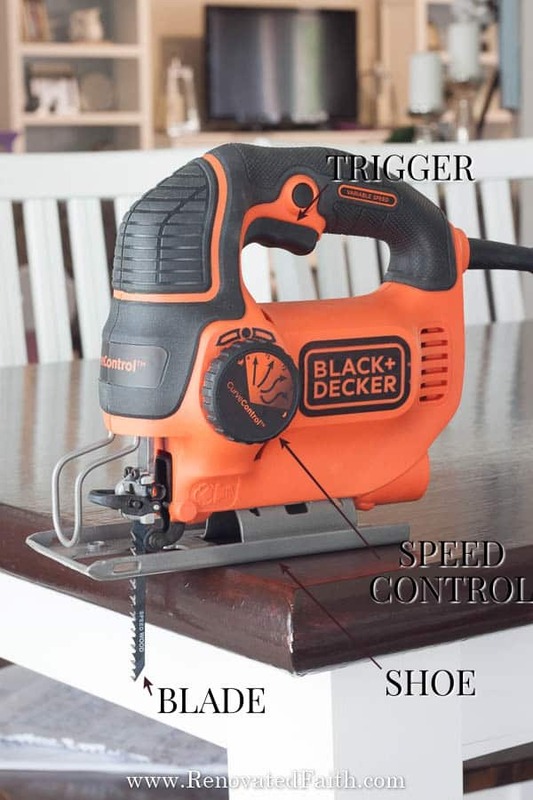 Here you can see a diagram of my jig saw, the Black and Decker BDEJS600C Smart Select Jig Saw, 5.0-Amp. The trigger starts the action of the blade. The blade is what actually does the cutting and the teeth face outward towards your cutting surface. This model uses t-shank blades which I highly recommend. These blades have an easy blade release. Other models require a separate tool to remove or put in a new blade and can be pretty time consuming. The shoe is the metal part at the bottom that is to be kept level with the cutting surface. You’ll also notice a speed adjust. The faster setting is best for straight lines and the slower setting is great for curves. Be sure to put on your safety glasses and also your mask just in case. When using a jig saw, you need to have some sort of line to follow so trace out your cut line with a pencil beforehand. 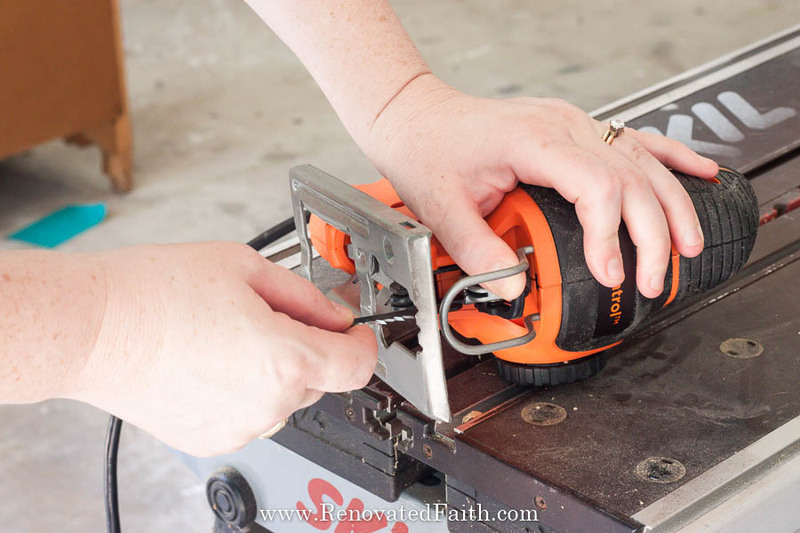 Be sure to have a steady surface to saw on, preferably a work bench of some sort. While your jig saw is still unplugged, insert the blade by pulling up on the quick release. Then insert the blade in and let go of the release. Slightly wiggle the blade to make sure it is in tight, being careful of the teeth. I highly recommend getting a jig saw with a t-shank blade as they all don’t have this quick release option. Plug in the jig saw and set your dial to the correct speed. For curved lines, do a slower speed and for straight lines use a faster speed. 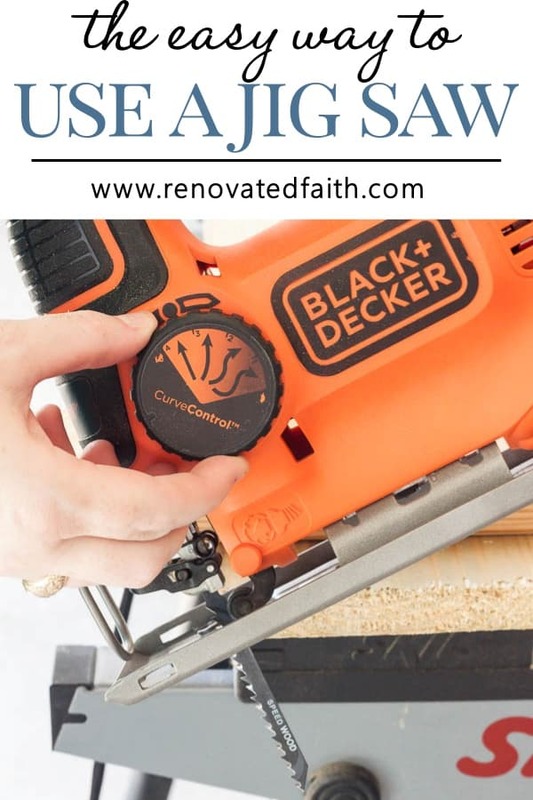 A jigsaw is one of the safest power tools you can goal and is great as a “beginner saw” However, as well all power tools you want to take precautions to ensure jigsaw safety. Always wear safety glasses and it is best to wear a mask to prevent breathing in sawdust. You also want to be aware of where you hand and blade is at all times while using a steady surface to place your cutting materials on. If possible, clamp down your piece of wood. You want to put the blade of the saw up against the edge where you will first start your cut. I like to barely press the trigger which will make the blade move slowly before going into the piece of wood. Then once it starts to cut into the wood, I depress the trigger more to speed up the blade. Using a jig saw is kind of like sewing for me. With sewing you start the needle slowly to get your barrings at first and then speed up along the line you are stitching. It works the same way with a jigsaw. Another similarity is that it helps to focus your eyesight about a centimeter ahead of the blade to keep your blade on the line as opposed to watching the blade itself. Ironically, I use a jig saw much better than I sew. Granted, I use the word “sew” loosely because I can only sew things with straight lines like pillows or hemming curtains. 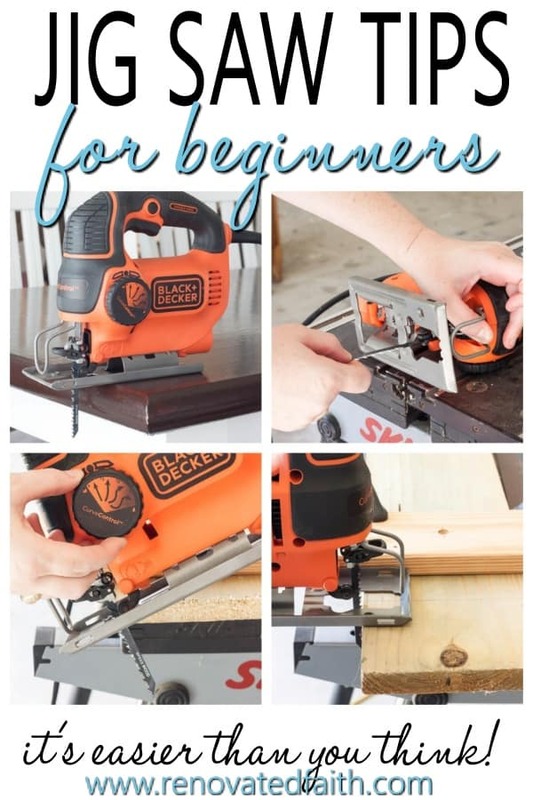 If you are using a jig saw for the first time, this is a video to get you started. Here I don’t use a clamp because the ceiling fan blades are so thin but use clamps if possible. Every once in a while I have to make an inside cut. Unfortunately, a jig saw only allows you to start from one edge of the cutting surface instead of from the middle. So I actually drill a hole first where I want to start my cut. Be sure to drill a whole larger than your jigsaw blade. Then, I insert the blade into the whole and start cutting to the edges of the shape I am cutting out. Easy Peasy! You can also do something called a plunge cut but the above method is a better bet for beginners. You want to trace a perfect circle using a protractor or trace something circular on your piece of wood. Then, do the same as above when drilling a whole inside your cut-out. 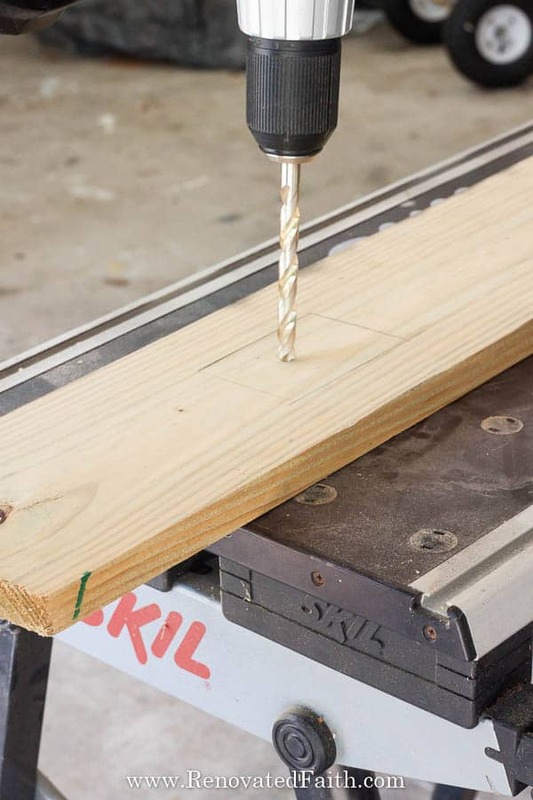 Drill a whole larger than the jig blade just inside the circle. Insert your jig blade and slowly cut around the perimeter of the circle. 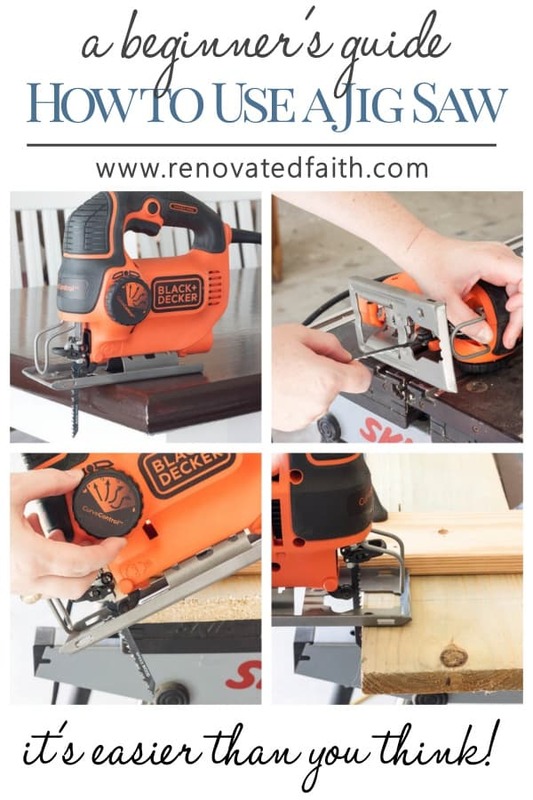 If you are wondering how to use a jig saw to cut curves, the key is to keep the speed on a lower setting and it doesn’t hurt to do a practice cut on a piece of wood beforehand. First mark your straight line on your cutting material using a straight edge. 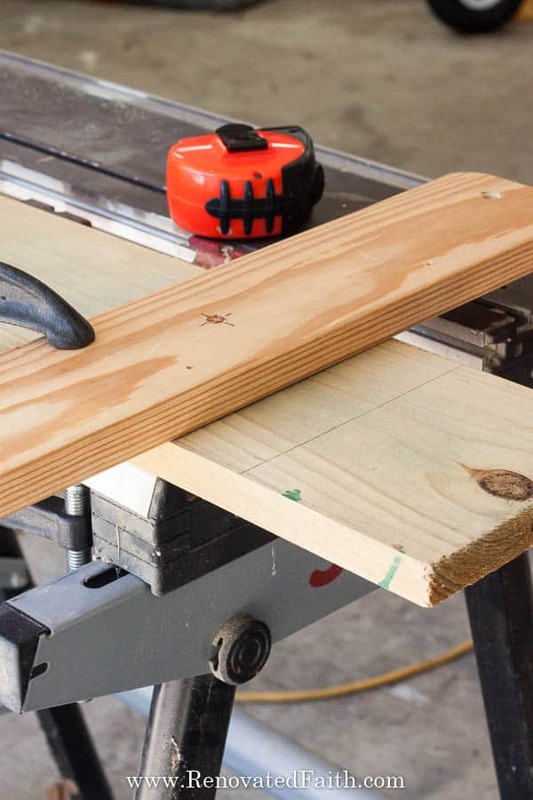 Line up the piece of wood parallel to the work bench. On your jigsaw, measure the distance from the side of the blade to the edge of the shoe. Now clamp a 1 by 4 or other straight edge so that it is that same distance from your cutting line. Be sure to clamp it on both ends tightly. Now your blade should line up perfectly with the line. If not, readjust and clamp again. Cut along the line as normal but this time you want to hug that 1 by 4 with your saw, making sure the edge of the saw’s shoe slides along that edge. Now you have a perfectly straight cut! What Blade Do I Use for a Jigsaw? Jig saws aren’t only for cutting wood. Here you can even find a jigsaw blade for cutting plastic and these are great for cutting metal. This set of blades gives you lots of options. Remember to use blades with tiny teeth for thinner materials like the ceiling fan blades in my DIY Windmill Decor and blades with larger teeth for thicker woods. 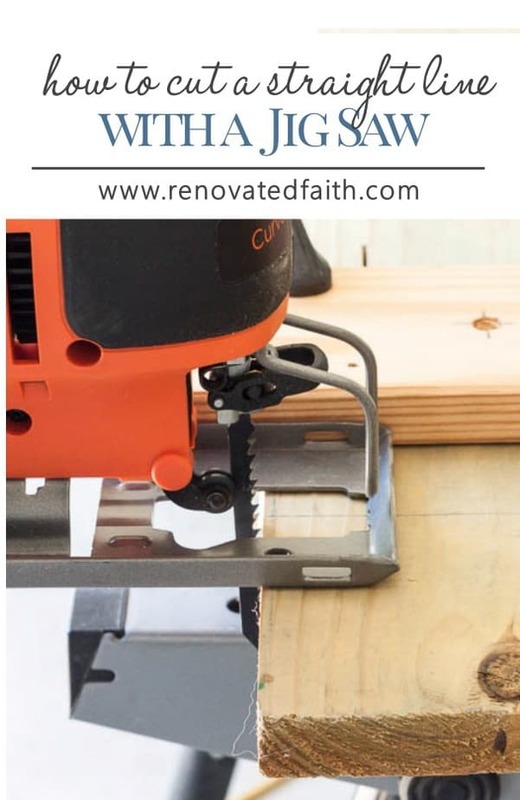 One of the disadvantages of a jigsaw tool is that it isn’t best for thicker pieces of wood but using a sharper blade with bigger teeth can help. You never want to force the blade through your material. Let the blade go at it’s own pace. Why is my Jigsaw Jumping? 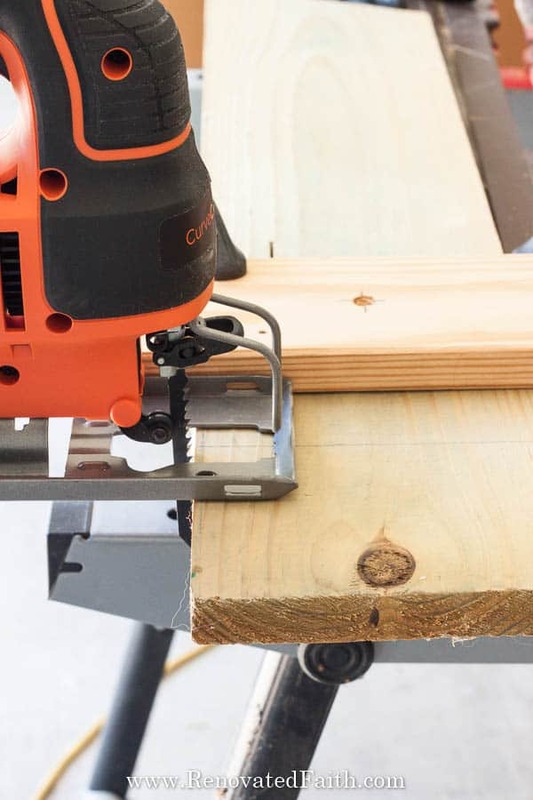 If you are feeling some kick-back on the saw when trying to cut a surface, it is usually one of two problems. Either your blade is too short or the teeth on the blade are too big. Also, take it slow and let the blade do the cutting; don’t force it. Be sure to check out my post on furniture painting tips below. They will definitely save you some time and help you to get a smooth, beautiful finish on your next furniture project. 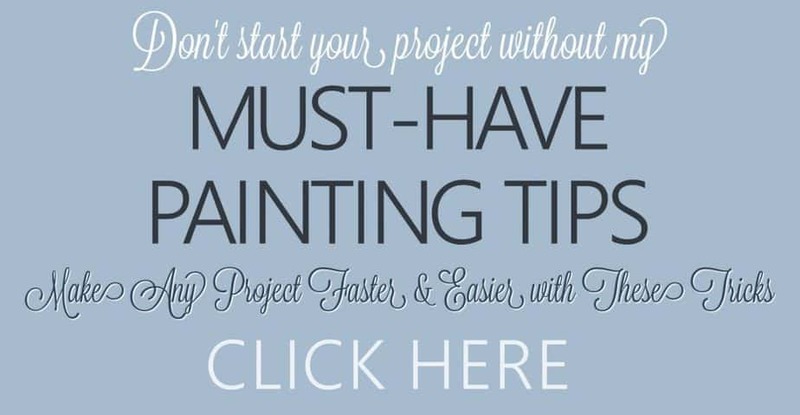 Click HERE to get my furniture painting tips. Thank you, Karin, for this tutorial! I am an OT, and an intro to woodworking class was part of our curriculum in school back in 1993. We did not use jigsaws, though, and after I received one as a gift in 2000, I regret that it took literally 18 more years until I felt brave enough to try it! Luckily it was still in good shape and worked as it was supposed to, and your instructions gave me some good tips to correct some things to make it easier for me to use. It is very empowering to be a female and have knowledge of power tools. I also love being the one to bring our sons to our local Home Depot for project-related materials! Thank you so much for sharing this with me! This reminds me of how I bought my sewing machine and it sat in my closet in the box for two years until I got the nerve to use it. Like the jig saw, I was amazed how easy it was once I actually started. Thank you for sharing your experience with me and I wish you all the best! And yes, it is absolutely empowering!! !